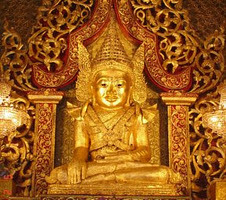 According to almost all Arakanese chronicles, it is asserted that the Mahamuni Image was cast during the reign of King Candasuriya of Arakan in the middle of six century B.C. when the Lord Buddha in his life time made his sojourn to Dhanyawadi, the ancient city of Arakan .1 ( the old site of Dhanyawadi is situated on the focus of East longitude 93º 3´ and North Latitude 20º 52´). However the modern historians believe it may have been in the second century A.D.2 Among the several places where King Ashoka of India (273-236 B.C) had sent the Buddhist missionaries, it included the name "Mahinsaka". 3 Mahinsaka is the ancient name of Arakan.4 In the Rakhaing Medhapinnya Mawguan Lunga, it was composed such as that Rakkha Pura (Arakan) either possesses the name "Mahinsaka". The Indian people especially of Bengal call the Arakanese as "Magh" or "Mogh".5 Magh may have also been derived from Mahinsaka/Mahka/Makh which sounds "Magh" or "Mogh".6 In Bengali literature, the vowel (a) sounds as (o). The Bengali people may have called Arakanese as Magh/Mogh or Maghad in sense of the people from Mahinsaka (Arakan). King Mahathamadaraza ascended the throne in 1784 A.D. and two years latter in 1784 there was a great flood of Gaiccapanadi (Kaladan river) which lasted for seven days. Among the people who sought shelter at the Mahamuni temple, the three women had given birth to three babies by the same time and a giant log reached onto the pedestal of Mahamuni Image. At night the people could hear the odd crises and sounds of trumpets and see the bad omens. Mandalay Mahamyatmuni pagoda is the great Mahamuni Image of Arakan. 1. Tun Shwe Khine (M.A. ): "History of Mahamuni" (in Burmese), 1991. 2. Dr. Qanungo: "History of Chittagong" (in English), 1986. 3. Ahn Maung (M.A. ): "2500 years of Buddhism" (in Burmese). 4. However, the historians of India have identified "Mahinsaka" as present "Mysore" of India. Kyaw Zan tha (M.A. ): "Buddhism in Arakan before Yedhamma" (Rakhine Tazaung Magazine), 1980, p.20. 5. "Magh", nowadays, has the notorious sense as "Pirate" because the"Magh" or "Rakhaing" who were clever at the maritime warfare had often raided "Bengal" by the sea-route during the glorious age of golden "Mrauk U". 6. a) More research works should be done on this view point. b) "Magh" is allied to Sanskrit word "Magh" which means "Superior". c) Some scholars believe the word "Magh" is a derivation from "Maghada" of India. d) "Magh", in Bengali Literature, is pronounced "Mogh". So is "Mahinsaka" pronounced as "Mohinsoko" and may be corrupted into "Mohinsoko/ Mohko/ Mokh/ Mogh. 1. a) Chan Htwan Oung: The Mahamuni Shrine in Arakan, J.B.R.S. (Journal of Burma Research Society). b) Oo Kala Maharazawin (in Burmese), Vol. III, p.104. c) Hmannanrazawin (in Burmese), Vol. III, p.104. 2. Sandamalalungara, Rakhaing Razawunthaik-kyan (in Burmese), Vol.III, p.104. 3. a) Rakhaing Razawunthaikkyan, Vol. I, p.286. b) Dr. Forchammer; The Mahamuni Pagoda, p.6. 5. a) Dr. Forchammer, The Mahamuni Pagoda, p.6. b) U Nyo Mya: Koombaung Shapoondaw, p.154. c) Rakhaing Razawunthaikkyan, Vol. I, p.307. d) Arakanese Princess Yaingcrong (Hantha-wadi Print) (in Arakanese), Stanza-14. 6. Chan Htwan Oung, Mahamuni Shrine in Arakan. J.B.R.S., P.263. 8. Dr. Forchammer: Arakan, p.6. 9. a) Rakhaing Razawunthaikkyan: Vol. I, p.323. b) Dr. Forchammer: Arakan, p.6. 11. a) Rakhaing Razawunthaikkyan: Vol. I, p.130, 323, 329, 331.
d) Dr. Forchammer: Mahamuni shrine in Arakan, p.265. e) Rakhaing Sgabre Razawun (Palm scripture in Arakanese), "Za" Sheet. f) Sara Ngame Razawun and Rhihoung Razawun (Manuscript copy from palm scripture). 12. a) Dhanyawadi Razawunthaikkyan, p.120. b) Rakhaing Sgabre Razawun, (Palm Scripture), "Zau" Sheet. 13. a) Dr. Forchammer: Mahamuni Pagoda, p.6. b) U Nyo Mya: Koombaung Shapoondaw, "Mahamuni History", p.155. 14. Rakhaing Sgabre Razawun (Palm scripture in Arakanese), "Lau" Sheet. 15. Ibid. (Twelve towns of Bengal are (1) Gatapalan (2) Kana (3) Chittagong (4) Padikhara (5) Tilinga (6) Comilla (7) Barisal (8) Moksuja (9) Dacca (10) Ganga-Sagara (11) Rounphru and (12) Sylhet. 17. Rakhaing Razawunthaikkyan, Vol. I., p.241. 18. U Nyo Mya: Mahamuni History, p.155. 20. a) Rakhaing Sgabre Razawun (Palm Scripture), "Taw" Sheet. b) Rakhaing Razawunthaikkyan, Vol. I, p.244. c) Dhanyawadi Razawunthaikkyan, Vol. I, p.277. 21. a) Rakhaing Sgabre Razawun, (Palm Scripture), "Htan" Sheet. b) Rakhaing Razawunthaikkyan, Vol. I, p.270. c) Rakhaing Razawunthaikkyan, Vol. I, p.276, 279. 22. Rakhaing Razawunthaikkyan, Vol. II, p.276, 279.
every year as mentioned in the table.